On October 9, 1942, Touhy and six other men escaped from Stateville prison. Touhy and the others were eventually discovered living in a Chicago boarding house. Touhy and three others surrendered peacefully. The remaining escapees tried to fight their way out and were killed. Touhy re-entered Stateville on December 31, 1942, and was sentenced to an additional 199 years in prison for the escape. The above photo, available for purchase at time of writing here , is of 1254 Leland, where the Touhy Gang lived. In 1944, 20th Century Fox released a semi-biographical and highly fictionalized film based on Touhy's life, called Roger Touhy, Gangster. To learn more about Touhy, read The Stolen Years. Interesting story, never knew this. My first longtime boyfriend lived at 1762 Leland in the 80s - 90s, his home took an entire block as it belonged to his grandparents and had been there for decades, though not sure how long. It definitely had an "old-time" feel in its construction along with a huge yard. Originally the family butcher shop I believe, that they (Luft family) exanded and converted into a home once the business closed. Definitely stood out on the block! The yard was so big, I wouldn't be surprised if it had been a farm at one point. Right across the street (on Hermitage/Leland) was the home were Carl Sandburg wrote Chicago. Unbeknownst to me at the time and not until decades later, but our childhood friend, Sarah lived there with her family for many years. And at the end of her block was the Abbott mansion, (again unbeknownst to us till years later) which is still there since it (along with the Sandburg) home has since been claimed as Landmarks. Back then, as kids, we knew none of this & just viewed these homes as staples of our neighborhood. The home I lived in on Ashland (4622 N) was dubbed the Pink House by my buddies and served as a two-flat but originally belonged to the Atkinson family. 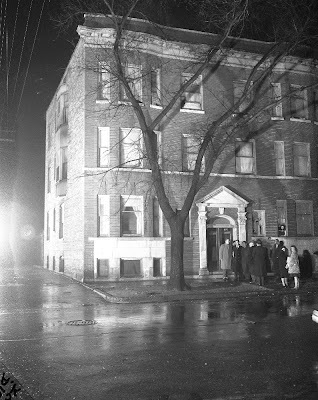 Jean Atkinson was the youngest child & had it converted into a thee-level building inside, but outside it still resembled a single-family house. She was in her late 80s when we moved in around 84 and she relocated to live with her family, I think. We found old medicine bottles and secret cabinets in the bathroom, with a hidden enclosed hamper and vanity that I loved, and the cobblestone in the oversized yard was still in tact and beautiful. So many fond memories.. it's all condos now though.